This is an appetizing way to serve fruit-one that will appeal to youngsters as well as to adults. I like to serve the kebabs along with spiced bran muffins for a healthy breakfast. They also make great snacks or dessert. 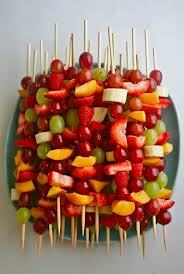 You can make kebabs with any fruit that will stay on the wooden skewer! The picture shown is just a variety of ways to make them. Kids love to make them too, just make sure there is adult supervision.